Home » Bacon , Fish , Grilling » Salmon, encased in Bacon! I love the taste of simply-cooked, simply-prepared fish as much as the next toffeenose, especially when it's a delicately nuanced fish like turbot or Dover sole. But what really gets me into a frothy, mouth-watering state of gastronomic excitement is the rich flavors of grilled sardines, smoked herring, or a nice, rich piece of salmon. I realize this isn't the most popular way to enjoy fish, as evident by my coworkers reaction when I put some smoked herring with mustard on rye into the lunchroom toaster over. The resulting smell led the company president to suggest that in the future I should, "eat my lunch in the bathroom." To preface, this wasn't quite so stinky. I was in the mood for a salmon steak, where they cut the fish right through the spine, so you have a cross-section of the salmon. 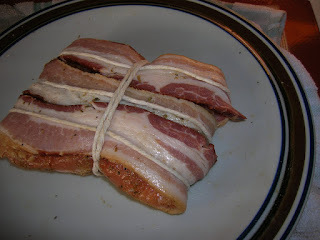 I thought it would be fun to do this steak-house style, wrapped with a ring of bacon and topped with hollandaise sauce. Two things didn't work out: they only had regular fillets, and I ran out of time for whisking up hollandaise. So I went to my love of mushrooms for an equally robust topping! Since this was a fillet, it wouldn't really work to just ring it with a slice of bacon. I had to do a bit of boyscout knot-tying in securing the porcine packaging to my ichthian parcel. But before this, I gave the salmon a quick seasoning rub with black pepper and a Cuban spice rub for a bit more backbone. I did a secure knot job, and would like to see how these fare on the grill, but for today I just pan-seared them. 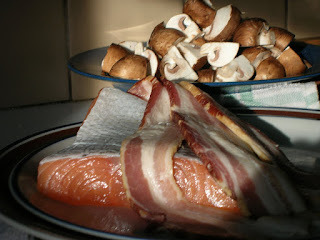 The bacon was a great insulator, keeping the salmon moist during the cooking. It also worked out that the bacon finished crisping up just as the salmon became just cooked through. The mushrooms got sauteed in a bit of the resulting bacon fat, then I topped the salmon off with a whole skillet full of them (but first I snipped off the string). 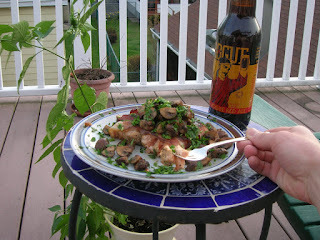 A dash of minced parsley, a nice Rogue Red Ale, and I was really to enjoy the spring weather with some al fresco dining on the porch!